Gaming chairs don’t look like your typical seating in the office; they are designed for optimum comfort during continuous gaming sessions. Whether you want to spend your free time on first-person shooter titles or practice a MOBA game for the coming competition, a good gaming chair will make it much easier to focus and enjoy. If you are planning to buy one, here are the 7 most important features to consider. Many people choose a gaming chair simple because it has a unique and outstanding design. Indeed, there is a variety of options available on the market, making it pleasantly comfortable to make a decision. However, you should know that there is often a trade-off between aesthetics and practicality. So if you want a cool-looking chair, chances are you might sacrifice a bit of ergonomics and comfort unless you have a generous budget. Since you will sit and play on a gaming chair many hours per day, it is important to choose a model which fits your body type, including weight and height. Otherwise, it can be uncomfortable when sitting for a long period. Since there aren’t any one-size-fits-all chairs, make sure to look at the weight and height requirements before deciding to purchase when shopping. Some models such as Secretlab’s Omega or DXracec’s Formula are specially created for smaller gamers, while the DXRacer’s Tanks are suitable for larger players. When choosing a gaming chair, it is best to go for reputable brands such as Maxnomic, Vertagear, Secretlab, or DXRacer because they come with the highest quality models and customer service. But if your budget is tight, then you can shop around and choose the same design from other brands which are less recognizable. In many cases, these models come from the same manufacturers but rebranded by different firms. Thus, what makes them really different is the price due to other intangible factors. Depending on your preferences and activities, there are many adjustment features to meet your needs. Color scheme and design is one of them. 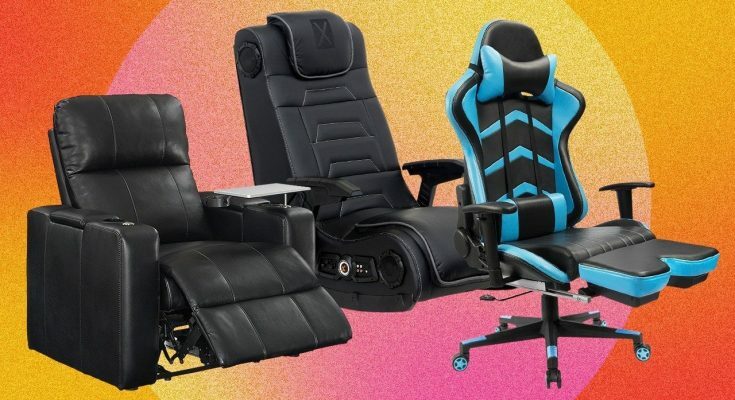 Also, it is a good idea to choose a comfy gaming office chair with footrest from http://officechairist.com which can be adjusted you that you can move your feet flexible during a game session. Other useful things that can make a gaming chair stand out include tilt-and-recline and armrest adjustment. This feature can be actually missed or hit in a gaming chair since the lumbar support often varies from person to person. A model that is comfortable for you can be too firm for the others, and vice versa. Therefore, it is better to check the chair in advance to see if it can provide the optimum support for your lumbar, which is important to ensure a good posture over time. Just like other products, it is better to test and sit in the gaming chair before purchasing it. By doing this, you can check if it fits your body and provides the optimal support for important parts. While many of them can be purchased online, you are likely to make a wrong decision just based on a few pictures and descriptions. In case you can’t try out in a store, then choose those online stores with a good return policy. The last thing to consider when choosing a gaming chair is to give it a few weeks before making the final decision. In many cases, you might feel uncomfortable at first due to a poor sitting posture rather than the chair itself. Also, it requires some time for your body to adjust to new positions on the chair, so do not decide yet until that point.